Surf and turf, the quintessential combination of grilled goodness, is a fun way to enjoy your favorite cuts of meat and seafood without over-commiting. Instead of the traditional steak-and-lobster pairing, why not mix things up? Scallops, shrimp and salmon all grill especially well! Not feeling up to a complicated dual-protein dinner? Seafood makes for a light, fresh meal on a hot summer's day. Southern flavors get a twist with these sweet and spicy shrimp skewers! 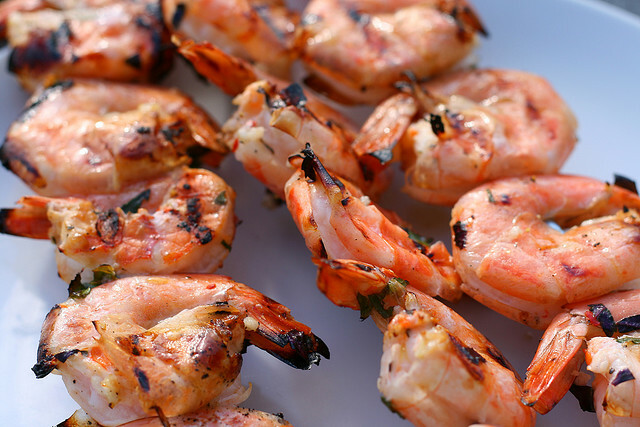 Sweet and tangy, these tiger prawns are as gorgeous as they are tasty! These shrimp skewers shimmy with Latin influences and are perfect for salads, tacos or stand alone! Sweet-spicy and creamy, the charred corn and poblano peppers pair perfectly with the avocado. Quick and easy, this recipe is ready in a flash but tastes like a gourmet entree! With the refreshing, cool tastes of spring this dish looks like pasta with pesto on steroids, but it is anything but traditional - and oh so delicious. Much healthier than its fried cousin, this grilled calamari is tangy-spicy-smoky and perfect as a starter, snack or on a salad. Perfect for lunch, this recipe is super quick and totally tasty. Quick and easy, this recipe combines Southern seasonings with the richness of native-Atlantic whitefish. Say hello to a new favorite. Never tried monkfish? Known as the "poor man's lobster" (its taste and texture are very similar to lobster tail), this is the perfect gateway recipe! Chargrilled and smoky, these tuna steaks are like no tuna you've had before. Cedar-planking is cool and everything, but why not experiment with wild-caught salmon while it's in season? This is the best recipe to get you started.